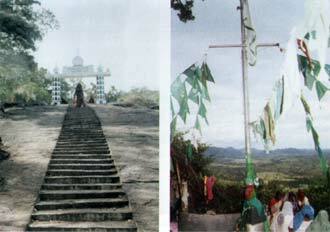 Left: Steps leading to Dafthar Jailani. Right: View of the Kaltota Plains. For over 800 years, Muslims in Sri Lanka have recited a mowlood or ratheeb (a recital of the life history of the Prophet Mohammed (SAL)) in honour of the greatest saint in Islam, namely Seyd-Us-Sheik Muhiyadeen Abdul Qadir Jailany, popularly known as Ghauzal Azam. Tens of thousands of Sri Lankans are adherents of the Qadiriya Thariqa (Order) that the Saint founded. 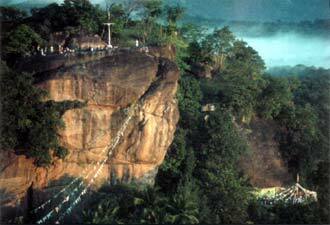 One of the areas in Sri Lanka particularly associated with the Saint is the jungle retreat of Dafther Jailany on the edge of the Balangoda Plateau between two rock formations known as Hituwangala and Kuragala, where the saint is said to have prayed and meditated. Kuragala is also known as "Soronga Malai" (Mountain of the cave) or as "Kaal-Adi Malai" (Foot print rock), so called because a faint impression of a foot appears below a large boulder. If you tap the rock below the boulder, one hears a hollow sound as if one is tapping on an empty cauldron. Hituwangala is also known as "Kai Adi Malai" (Palm print rock). This is where the mosque - with a Mihrab carved on the rock facing the Kaaba in Mecca - is situated and where the Saint is said to have placed his palm print in sandalwood paste. Kuragala, where the saint is said to have meditated, is higher than Hituwangala. The seat of meditation is about six feet by four feet, perched precariously on the edge of the cliff, with a huge boulder that serves as a natural roof sheltering the seat from rain and sun. The platform can be reached through a narrow passage that is between two rocks. The platform overlooks the Kaltota Plains and faces the southern seacoast, which is visible on a clear day. One can trace the Walawe Ganga meandering through the jungle to meet the Uda Walawe Tank. Fertile paddy lands are now seen where once thick jungles existed. The Uda Walawe Tank can also be seen from the Kuragala Rock.